It’s two different stories for two different children,” says Jeremy Ellertson, father of 11-year-old Christian and 3-year-old Christopher. Both children suffered from a heart disease present at birth. Jeremy continues, “Christopher got sick at a month old and received a heart transplant 24 days after being put on the list. Christian received his heart transplant at 7-months-old, he was extremely ill.” Vivianne Ellertson, mother and wife, adds, “Other area hospitals wouldn’t take Christian because of how severe his condition was. 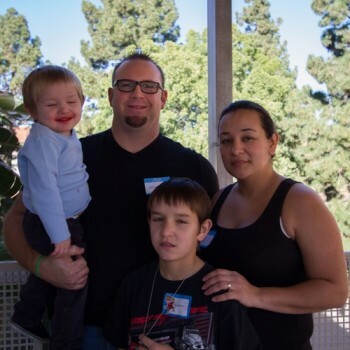 UCLA was the only hospital that gave us an opportunity.” Thanks to UCLA, both children received the transplant they needed and are healthy enough to live a normal life. Jeremy says, “We’ve been fortunate to have such a great team, such great doctors, with us.